Gluteala is highly effective in reducing excess body fat, preventing unnatural fettering of specific areas of the body such as the waist hips, thighs, shoulders and hands, efficiently controls harmful cholesterol and rids the body of aches and pains, helping alleviate pain caused by arthritis. 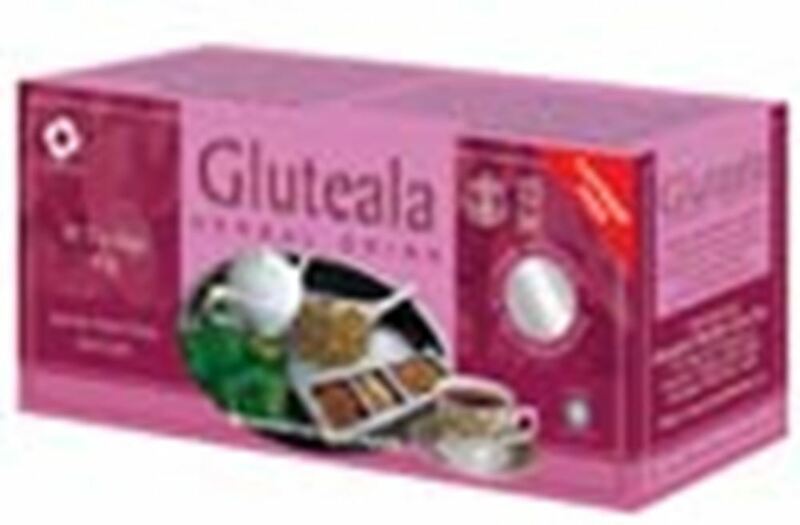 Gluteala herbal drink is made to an Ayurvedic formula and does not contain any tea or related substance. It’s made purely from Ayurvedic herbal ingredients. Gluteala is highly effective in reducing excess body fat, preventing unnatural fettering of specific areas of the body such as the waist hips, thighs, shoulders and hands, efficiently controls harmful cholesterol and rids the body of aches and pains, helping alleviate pain caused by arthritis. Gluteala revitalizes the physique to help you live a fuller and healthier life. Pour boiling water directly onto one or two bags. For a perfect brew, keep bags in the cup for 3 or 4 minutes. Use a spoon to extract the essence. Sugar may be used, but for the best taste do not add sugar. Stir well and enjoy your herbal drink. Drink twice a day. According to Ayurveda mostly Joint & Muscle pains are caused by the aggravation of vata (air) dosha. It is a condition which is caused by accumulation of ama and aggravation of vata. (Ama is a toxic by-product of improper digestion. )This ama circulates in the whole body and deposits or gets collected at the sites which are weaker. When it deposits in the joints and at the same time there is aggravation of vata , it results in a disease called amavata that all results of Joint Pains. *Avoid curd & all sour items pulses (except moong dal), rice, meat, fish, white bread, sugar, refined cereals, fried foods, tea or coffee. *Have potato & lemon juice. *Celery seeds, bitter gourd are highly beneficial. Causes include both internal and external factors. Ama associated with Vata (internal moving body air) quickly moves to different parts of the body and accumulates where circulation is sluggish or slow such as the hands, knees and other bone joints filling the blood vessels with a waxy type material. It is also more common in old age when Vata naturally increases in the body. Meat diet, foods such as ice cream, to much concentrated dairy such as aged cheese or goods of sour cream or cheese with your meals, cold foods especially during cold weather which weaken the digestion, heavy cakes, pastries and candies, packaged and processed foods with little fiber are the main dietary causes. Gas producing vegetables and legumes also create more internal air which moves the toxins to different parts also the condition. This ama blocks tissue pores and passages. This causes heaviness and weakness of the heart which becomes the seat of the disease. Murraya koenigii, premna serratifolia, garcina cambogia, phyllanthus emblica, Holarrhena antidysenterica, pongania glabra.